Concrete is a composite building material made from a mixture of sand, gravel, crushed rock, or other aggregates (coarse and fine) held together in a stone like mass with a binder such as cement and water. The stone like mass is formed due to the hydration of cement and eventually due to its hardening. Sometimes one or more admixtures (plasticizers, super plasticizers, accelerators, retarders, pazolonic materials, air entertaining agents, fibers, polymers and silica furies) are added to change certain characteristics of the concrete such as its workability, durability, and time of hardening. Hardened concrete has a high compressive strength and a very low tensile strength. Concrete is one of the most popular materials for buildings because it has high compressive strength, flexibility in its form and it is widely available. The history of concrete usage dates back for over a thousand years. Contemporary cement concrete has been used since the early nineteenth century with the development of Portland cement. Despite the high compressive strength, concrete has limited tensile strength, only around 10 % of its compressive strength and zero strength after cracks develop. In the late nineteenth century, reinforcement materials, such as iron or steel rods, began to be used to increase the tensile strength of concrete. Today concrete is generally strengthened using steel bars known as reinforcement bars (rebars in short) in the tension zone. Such elements are known as ‘reinforced concrete’. In the reinforced concrete, concrete and steel deform together and hence ribbed reinforcing bars are used for increasing the capacity to resist bond stresses. Reinforced concrete can be moulded to any complex shape using suitable form work. It has high durability, better appearance, fire resistance and is economical. It is a combination of concrete and steel wherein the steel reinforcement provides the tensile strength which is lacking in the concrete. For a strong, ductile and durable construction, the reinforcement is to have high strength, high tensile strain and good bond to concrete and thermal compatibility. Steel reinforcement is also capable of resisting compression forces and is used in columns as well as in other locations. Building components like slab walls, beams, columns foundation and frames are constructed with reinforced concrete. Reinforced concrete can be cast in-situ concreted or can be precast concrete. Reinforced concrete is an important material available for construction. It is a universal construction material and is used in one form or another for almost all structures, great or small such as buildings, bridges, pavements, dams, retaining walls, tunnels, drainage and irrigation facilities, tanks etc. The numerous advantages of reinforced concrete are given below. It has considerable compressive strength per unit cost compared with most other materials. It has high resistance to the actions of fire and water and, in fact, is the best structural material available for situations where water is present. During fires of average intensity, members with a satisfactory cover of concrete over the reinforcement bars suffer only surface damage without failure. Reinforced concrete structures are very rigid. It has a low-maintenance cost. As compared with other materials, it has a very long service life. Under proper conditions, reinforced concrete structures can be used indefinitely without reduction of their load carrying capabilities. This can be explained by the fact that the strength of concrete does not decrease with time but actually increases over a very long period, measured in years, because of the lengthy process of the solidification of the cement paste. It is usually the only economical material available for footings, floor slabs, basement walls, piers, and similar applications. A special feature of concrete is its ability to be cast into an extraordinary variety of shapes from simple slabs, beams, and columns to great arches and shells, making it widely used in precast structural components. In most areas, concrete takes advantage of inexpensive local materials (sand, gravel, and water) and requires relatively small amounts of cement and reinforcing steel. A lower grade of skilled labour is needed for erection as compared with other materials such as structural steel. For using reinforced concrete successfully, the designer must be completely familiar with its weak points in addition to its strong ones. The disadvantages of the reinforced concrete are given below. Concrete has a very low tensile strength, requiring the use of tensile reinforcement (zero strength after cracks develop). It needs mixing, casting, and curing, all of which affect the final strength of concrete. Forms are required to hold the concrete in place until it hardens sufficiently. In addition, false work or shoring may be necessary to keep the forms in place for roofs, walls, floors, and similar structures until the concrete members gain sufficient strength to support themselves. The cost of the forms used to cast concrete is relatively high. The cost of form material and artisanry may be equal to the cost of concrete placed in the forms. It has a lower compressive strength than steel (about 1/10, depending on material), which requires large sections in columns of multistory buildings. The low strength per unit of weight of concrete leads to heavy members. This becomes an increasingly important matter for long span structures, where concrete’s large dead weight has a great effect on bending moments. Lightweight aggregates can be used to reduce concrete weight, but the cost of the concrete is increased. Similarly, the low strength per unit of volume of concrete means members are relatively large, an important consideration for tall buildings and long span structures. The properties of concrete vary widely because of variations in its proportioning and mixing. Furthermore, the placing and curing of concrete is not as carefully controlled as is the production of other materials, such as structural steel and laminated wood. Cracks develop in concrete due to shrinkage and the application of live loads. Two other characteristics that can cause problems are concrete’s shrinkage and creep. Concrete and steel reinforcement work together in reinforced concrete structures. The advantages of each material seem to compensate for the disadvantages of the other. For instance, the great shortcoming of concrete is its lack of tensile strength, but tensile strength is one of the great advantages of steel. Steel reinforcement bars have tensile strengths equal to approximately 100 times that of the concretes normally used. The two materials bond together very well so there is little chance of slippage between the two. Thus they act together as a unit in resisting forces. The excellent bond obtained is the result of the chemical adhesion between the two materials, the natural roughness of the bars, and the closely spaced rib shaped deformations rolled onto the bars’ surfaces. Reinforcement bars are subject to corrosion, but the concrete surrounding them provides the bars with excellent protection. The strength of exposed steel subjected to the temperatures reached in fires of ordinary intensity is nil, but enclosing the reinforcing steel in concrete produces very satisfactory fire ratings. Finally, concrete and steel work well together in relation to temperature changes because their coefficients of thermal expansion are quite close. Concretes made with normal Portland cement require about 2 weeks for achieving a sufficient strength to permit the removal of forms and the application of moderate loads. Such concretes reach their design strengths after about 28 days and continue to gain strength at a slower rate thereafter. On many occasions it is desirable to speed up construction by using high-early-strength cements, which, although more expensive, are capable of obtaining the desired strengths in 3 to 7 days. These cements are particularly useful for the fabrication of precast members, in which the concrete is placed in forms where it quickly gains desired strengths and is then removed from the forms and the forms are used to produce more members. Obviously, the quicker the desired strength is obtained, the more efficient is the operation. A similar case can be made for the forming of concrete buildings floor by floor. High-early strength cements can also be used advantageously for emergency repairs of concrete and for shotcreting (where a mortar or concrete is blown through a hose at a high velocity onto a prepared surface). There are other special types of Portland cements available. The chemical process that occurs during the setting or hardening of concrete produces heat. For very massive concrete structures such as dams, mat foundations, and piers, the heat dissipates very slowly and can cause serious problems. It causes the concrete to expand during hydration. When cooling, the concrete shrinks and severe cracking often occurs. Concrete may be used where it is exposed to various chlorides and/or sulphates. Such situations occur in seawater construction and for structures exposed to various types of soil. Some Portland cements are manufactured that have lower heat of hydration, and others are manufactured with greater resistance to attack by chlorides and sulphates. There are usually five types of Portland cements. These different cements are manufactured from just about the same raw materials, but their properties are changed by using various blends of those materials. Type 1 Portland cement is the normal cement used for most construction, but four other types of the cements are useful for special situations in which high early strength or low heat or sulphate resistance is needed. These five types are given below. Type 1 – It is the common, all-purpose cement used for general construction work. Type 2 – It is modified cement that has a lower heat of hydration than does Type 1 cement and that can withstand some exposure to sulphate attack. Type 3 – It is high early strength cement that produces in the first 24 hours a concrete with strength about twice that of Type 1 cement. This cement does have a much higher heat of hydration. Type 4 – It is low-heat cement that produces a concrete which generates heat very slowly. It is used for very large concrete structures. Type 5 – It is the cement used for concretes that are to be exposed to high concentrations of sulphate. The properties of Type 1 cement can be modified to produce the desired effect with the help of various admixtures. Materials added to concrete during or before mixing are referred to as admixtures. They are used to improve the performance of concrete in certain situations as well as to lower its cost. 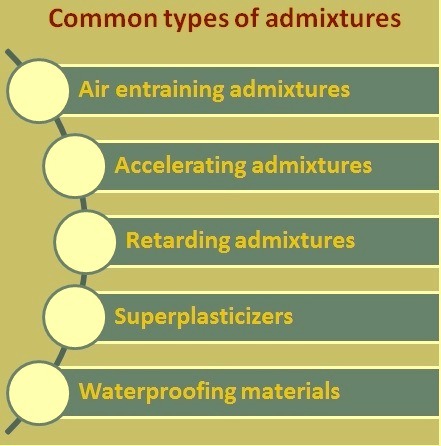 Some of the most common types of admixtures are listed and briefly described below (Fig 1). Air-entraining admixtures – These are used primarily to increase concrete’s resistance to freezing and thawing and provide better resistance to the deteriorating action of chemicals and salts. The air-entraining agents cause the mixing water to foam, with the result that billions of closely spaced air bubbles are incorporated into the concrete. When concrete freezes, water moves into the air bubbles, relieving the pressure in the concrete. When the concrete thaws, the water can move out of the bubbles, with the result that there is less cracking than if air entrainment had not been used. Accelerating admixtures – The addition of these admixtures, such as calcium chloride, to concrete accelerates its early strength development. The results of such additions are reduced times required for curing and protection of the concrete and the earlier removal of forms. However, because of corrosion problems, calcium chloride may not be added to concretes with embedded aluminum, concretes cast against stay-in-place galvanized steel forms, or pre-stressed concretes. Other accelerating admixtures that may be used include various soluble salts as well as some other organic compounds. Retarding admixtures – These are used to slow the setting of the concrete and to retard temperature increases. They consist of various acids or sugars or sugar derivatives. Retarding admixtures are particularly useful for large pours where significant temperature increases can occur. They also prolong the plasticity of the concrete, enabling better blending or bonding of successive pours. Retarding admixtures can also slow the hydration of cement on exposed concrete surfaces or formed surfaces to produce attractive exposed aggregate finishes. Superplasticizers – These are admixtures made from organic sulfonates. Their use enables the reduction of the water content in concretes substantially while at the same time increasing their slumps. Although superplasticizers can also be used to keep water-cement ratios constant while using less cement, they are more commonly used to produce workable concretes with considerably higher strengths while using the same amount of cement. A relatively new product, self-consolidating concrete, uses superplasticizers and modifications in mix designs to produce an extremely workable mix that requires no vibration, even for the most congested placement situations. Waterproofing materials – These are usually applied to hardened concrete surfaces, but they can be added to concrete mixes. These admixtures generally consist of some type of soap or petroleum products, as perhaps asphalt emulsions. They may help retard the penetration of water into porous concretes but probably do not help dense, well-cured concretes very much. The different properties of concrete are described below. The compressive strength of concrete is determined by testing to failure 28 day-old 150 mm diameter by 300 mm concrete cylinders at a specified rate of loading. For the 28 day period, the cylinders are usually kept under water or in a room with constant temperature and 100 % humidity. Although concretes are available with 28 day ultimate strengths from 175 kg/sq cm up to as high as 700 kg/sq cm, most of the concretes used fall into the range of 200 kg/sq cm to 500 kg/sq. cm. For ordinary applications, 200 kg/sq cm and 280 kg/sq cm concretes are used, whereas for pre-stressed construction, 350 kg/sq cm and 425 kg/sq cm strengths are common. The values obtained for the compressive strength of concretes, as determined by testing, are to a considerable degree dependent on the sizes and shapes of the test units and the manner in which they are loaded. In many countries, the test specimens are cubes, 200 mm on each side. For the same batches of concrete, the testing of 150 mm by 300 mm cylinders provides compressive strengths only equal to about 80 % of the values determined with the cubes. Concrete has no clear-cut modulus of elasticity. Its value varies with different concrete strengths, concrete age, type of loading, and the characteristics and proportions of the cement and aggregates. Furthermore, there are several different definitions of the modulus as given below. The initial modulus is the slope of the stress-strain diagram at the origin of the curve. The tangent modulus is the slope of a tangent to the curve at some point along the curve – as an example, at 50 % of the ultimate strength of the concrete. The slope of a line drawn from the origin to a point on the curve somewhere between 25 % and 50 % of its ultimate compressive strength is referred to as a secant modulus. Another modulus, called the apparent modulus or the long-term modulus, is determined by using the stresses and strains obtained after the load has been applied for a certain length of time. The dynamic modulus of elasticity, which corresponds to very small instantaneous strains, is usually obtained by sonic tests. It is generally 20 % to 40 % higher than the static modulus and is approximately equal to the initial modulus. When structures are being analyzed for seismic or impact loads, the use of the dynamic modulus seems appropriate. As a concrete cylinder is subjected to compressive loads, it not only shortens in length but also expands laterally. The ratio of this lateral expansion to the longitudinal shortening is referred to as Poisson’s ratio. Its value varies from about 0.11 for the higher-strength concretes to as high as 0.21 for the weaker-grade concretes, with average values of about 0.16. There does not seem to be any direct relationship between the value of the ratio and the values of items such as the water-cement ratio, amount of curing. For most reinforced concrete designs, no consideration is given to the so-called Poisson effect. It may very well have to be considered, however, in the analysis and design of arch dams, tunnels, and some other statically indeterminate structures. Spiral reinforcments in columns takes advantage of Poisson’s ratio. When the materials for concrete are mixed, the paste consisting of cement and water fills the voids between the aggregate and bonds the aggregate together. This mixture needs to be sufficiently workable or fluid so that it can be made to flow in between the reinforcment bars and all through the forms. To achieve this desired workability, considerably more water (perhaps twice as much) is used than is necessary for the cement and water to react (hydration). After the concrete has been cured and begins to dry, the extra mixing water that was used begins to work its way out of the concrete to the surface, where it evaporates. As a result, the concrete shrinks and cracks. The resulting cracks may reduce the shear strength of the members and be detrimental to the appearance of the structure. In addition, the cracks can cause the reinforcement to be exposed to the atmosphere or chemicals thereby increasing the possibility of corrosion. Shrinkage continues for many years, but under ordinary conditions probably about 90 % of it occurs during the first year. The amount of moisture that is lost varies with the distance from the surface. Furthermore, the larger the surface area of a member in proportions to its volume, the larger is the rate of shrinkage which means that the members with small cross sections shrink more proportionately than do those with large cross sections. The amount of shrinkage is heavily dependent on the type of exposure. For instance, if concrete is subjected to a considerable amount of wind during curing, its shrinkage is greater. Similarly, a humid atmosphere means less shrinkage, whereas a dry atmosphere results into more shrinkage. To minimize shrinkage it is desirable (i) to keep the amount of mixing water to a minimum, (ii) to cure the concrete well, (iii) to place the concrete for walls, floors, and other large items in small sections (thus allowing some of the shrinkage to take place before the next section is placed), (iv) to use construction joints to control the position of cracks, (v) to use shrinkage reinforcement, and (vi) to use appropriate dense and nonporous aggregates. Under sustained compressive loads, concrete continues to deform for long periods of time. After the initial deformation occurs, the additional deformation is called creep, or plastic flow. If a compressive load is applied to a concrete member, an immediate or instantaneous elastic shortening occurs. If the load is left in place for a long time, the member continue to shortens over a period of several years, and the final deformation is normally be two to three times the initial deformation. Usually long-term deflections are also being as much as two or three times initial deflections. Perhaps 75 % of the total creep occurs during the first year. If the long-term load be removed, the member recovers most of its elastic strain and a little of its creep strain. If the load is replaced, both the elastic and creep strains again develop. The amount of creep is largely dependent on the amount of stress. It is almost directly proportional to stress as long as the sustained stress is not greater than about one-half of compressive strength. Beyond this level, creep increases rapidly. Several other items which affect the amount of creep are given below. The longer the concrete cures before loads are applied, the smaller is the creep. Steam curing which causes quicker strengthening, also reduces creep. Higher strength concretes have less creep than the lower strength concretes stressed at the same values. However, applied stresses for higher strength concretes are, in all probability, higher than those for lower strength concretes, and this fact tends to cause increasing creep. Creep increases with higher temperatures. It is highest when the concrete temperature is at around 65 deg C to 70 deg C.
The higher the humidity, the smaller is the free pore water that can escape from the concrete. Creep is almost twice as large at 50 % humidity than at 100 % humidity. It is obviously quite difficult to distinguish between shrinkage and creep. Concretes with the highest percentage of cement-water paste have the highest creep because the paste, not the aggregate, does the creeping. This is particularly true if a limestone aggregate is used. Obviously, the addition of reinforcement to the compression areas of concrete greatly reduces creep because steel exhibits very little creep at ordinary stresses. As creep tends to occur in the concrete, the reinforcement blocks it and picks up more and more of the load. Large concrete members (those with large volume-to-surface area ratios) have creep proportionately less than smaller thin members where the free water has smaller distances to travel to escape. The tensile strength of concrete varies from about 8 % to 15 % of its compressive strength. A major reason for this small strength is the fact that concrete is filled with fine cracks. The cracks have little effect when concrete is subjected to compression loads because the loads cause the cracks to close and permit compression transfer. Obviously, this is not the case for tensile loads. Although tensile strength is normally neglected in design calculations, it is nevertheless an important property that affects the sizes and extent of the cracks that occur. Furthermore, the tensile strength of concrete members has a definite reduction effect on their deflections. Once tensile cracking has occurred, concrete has no more tensile strength. The tensile strength of concrete does not vary in direct proportion to its ultimate compression strength. It does, however, vary approximately in proportion to the square root of compressive strength. The tensile strength of concrete in flexure is quite important when considering beam cracks and deflections. For these considerations, the tensile strengths obtained with the modulus of rupture test have long been used. The modulus of rupture (which is defined as the flexural tensile strength of concrete) is usually measured by loading a 150 mm × 150 mm × 75 mm plain (i.e., unreinforced) rectangular beam (with simple supports placed 600 mm on centre) to failure with equal concentrated loads at its one-third points. The load is increased until failure occurs by cracking on the tensile face of the beam. The modulus of rupture is then determined from the flexure formula. The stress determined in this manner is not very accurate because, in using the flexure formula, it is assumed that the concrete stresses vary in direct proportion to the distances from the neutral axis. Even though pads are used under the loads, some local stress concentrations occur during the tests. In addition, some stresses develop at right angles to the tension stresses. As a result, the tensile strengths obtained are not very accurate. It is extremely difficult in laboratory testing to obtain pure shear failures unaffected by other stresses. As a result, the tests of concrete shearing strengths through the years have yielded values all the way from one-third to four-fifths of the ultimate compressive strengths. The aggregates used in concrete occupy about three-fourths of the concrete volume. Since they are less expensive than the cement, it is desirable to use as much of them as possible. Both fine aggregates (usually sand) and coarse aggregates (usually gravel or crushed stone) are used. Any aggregate that passes a sieve in which has number of wires spaced 300 mm on centres in each direction is said to be fine aggregate. Material of a larger size is coarse aggregate. Aggregates are to be strong, durable, and clean. If there are dust or other particles present, they can interfere with the bond between the cement paste and the aggregate. The strength of the aggregate has an important effect on the strength of the concrete, and the aggregate properties greatly affect the concrete’s durability. Concretes with compression strengths with more than 425 kg/sq mm are referred to as high-strength concretes. These concretes are also sometimes called high-performance concretes because they have other excellent characteristics besides just high strengths. For example, the low permeability of such concretes causes them to be quite durable as regards the various physical and chemical agents acting on them that may cause the material to deteriorate. High-strength concretes are sometimes used for both precast and pre-stressed members. They are particularly useful in the precast industry where their strength enables the production of smaller and lighter members, with consequent savings in storage, handling, shipping, and erection costs. In addition, they have sometimes been used for offshore structures, but their common use has been for columns of tall reinforced concrete buildings, where the column loads are very large. In recent years, a great deal of interest has been shown in fibre reinforced concrete, and today there is much ongoing research on the subject. The fibres used are made from steel, plastics, glass, and other materials. Various experiments have shown that the addition of such fibres in convenient quantities (normally up to about 1 % or 2 % by volume) to conventional concretes can appreciably improve their characteristics. The compressive strengths of fibre reinforced concretes are not significantly greater than they would be if the same mixes were used without the fibres. The resulting concretes, however, are substantially tougher and have greater resistance to cracking and higher impact resistance. The use of fibres has increased the versatility of concrete by reducing its brittleness. It is to be noted that a reinforcement bar provides reinforcing only in the direction of the bar, while randomly distributed fibres provide additional strength in all directions. Steel is the most commonly used material for the fibres. The resulting concretes seem to be quite durable, at least as long as the fibres are covered and protected by the cement mortar. Concretes reinforced with steel fibres are most often used in pavements, thin shells, and precast products as well as in various patches and overlays. Glass fibres are more often used for spray-on applications as in shotcrete. The fibres used vary in length from about 6 mm up to about 75 mm while their diameters run from approximately 0.25 mm to 0.75 mm. For improving the bond with the cement paste, the fibres can be hooked or crimped. In addition, the surface characteristics of the fibres can be chemically modified in order to increase bonding. The improvement obtained in the toughness of the concrete (the total energy absorbed in breaking a member in flexure) by adding fibres is dependent on the fibres’ aspect ratio (length/diameter). Typically, the aspect ratios used vary from about 25 up to as much as 150, with 100 being about an average value. Other factors affecting toughness are the shape and texture of the fibres. The compressive strength of concrete is dictated by exposure to freeze-thaw conditions or chemicals such as sulphates. These conditions may require a greater compressive strength or lower water–cement ratio than those required to carry the calculated loads. For concrete exposed to chemicals, the amount of fly ash or other pozzolans is limited. The steel reinforcement used for concrete structures may be in the form of bars or welded wire fabric. Reinforcement bars are referred to as plain or deformed. The deformed bars, which have ribbed projections rolled onto their surfaces (patterns differing with different manufacturers) to provide better bonding between the concrete and the steel, are used for almost all applications. Plain bars are not used very often except for wrapping around longitudinal bars, primarily in columns. Plain round bars are indicated by their diameters in mm. Reinforcement bars were formerly manufactured in both round and square cross sections, but today all bars are round. Welded wire fabric is also frequently used for reinforcing slabs, pavements, and shells, and places where there is normally not sufficient room for providing the necessary concrete cover required for regular reinforcement bars. The mesh is made of cold-drawn wires running in both directions and welded together at the points of intersection. The sizes and spacings of the wire may be the same in both directions or may be different, depending on design requirements. Wire mesh is easily placed and has excellent bond with the concrete, and the spacing of the wires is well controlled.